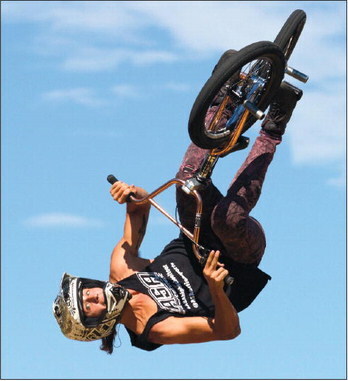 Alex Landeros flips during a BMX bike demonstration as part of an anti-bullying program at Waukesha North on Monday. 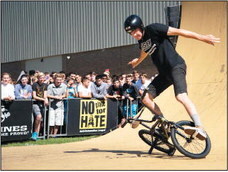 The ASA Entertainment High School Tour brought extreme sports and a message against bullying to the school. Four BMX riders and a skateboarder performed on a half-pipe set up outside the school as emcee Dustin Grice shared information about the prevalence of bullying and strategies for dealing with bullies. The event was sponsored by the Anti-Defamation League and the U.S. Marine Corps. Trevor Meyer demonstrates flatland tricks as part of an anti-bullying program at Waukesha North on Monday. Waukesha North students watch as Chilean BMX rider Coco Zorita does a flip.